SEQUENTIAL, the iPad app for digital graphic novels, is delighted to announce the release on Valentine’s Day of an exclusive expanded edition of True Love by Posy Simmonds, the acclaimed Guardian cartoonist and author of the Gemma Bovery and Tamara Drewe graphic novels. Originally published in 1981, True Love has a strong claim to be the first ever British graphic novel published for adults. A sharp satire on the idealised romantic love promised in romance comics, True Love tells the story of plain and single office worker Janice Brady who dreams of being swept off her feet. Over 30 years later, True Love is being celebrated via SEQUENTIAL’s acclaimed digital graphic novel platform, where the original pages are presented in glorious high-definition and supplemented with a host of extras including audio from Posy Simmonds, sketches and artwork, and materials from the original conception and creation process, including an in-depth look at the mysteries of Posy’s notebook – and her mirror writing! “I’m so glad that True Love is going to have new digital life on SEQUENTIAL.” said Posy, who collected together materials for the enhanced extras, including the original cover artwork, sketches, and the notebook in which True Love was drafted. The expanded edition is 100 pages and priced at £9.99 / $12.99. 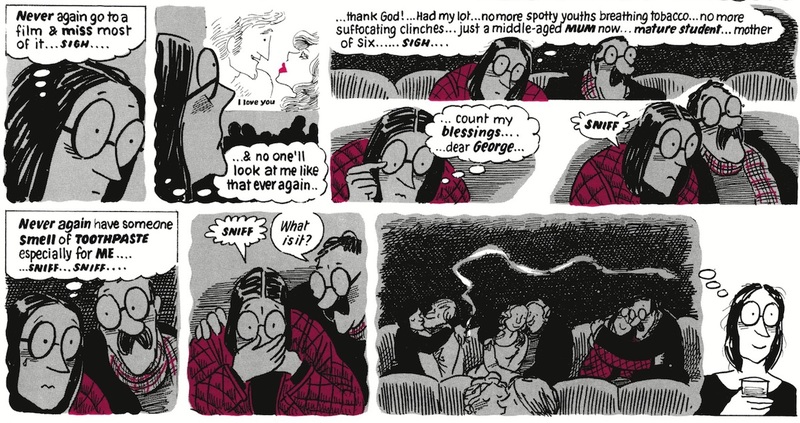 Posy Simmonds is one of the UK’s most treasured authors, with long-running strips in The Guardian that would become Gemma Bovery, Tamara Drewe, Mrs. Weber’s Diary, and more. She has also contributed strips to The Spectator and Harper’s Magazine, and has written a number of best-selling children’s books including Fred, Bouncing Buffalo and Lulu and the Flying Babies. She was made a Member of the Order of the British Empire in 2002 for services to the newspaper industry. SEQUENTIAL is the graphic novel storefront app for iPad. The app features material from the best publishers of graphic novels across the world, including Fantagraphics, Top Shelf, Dark Horse, NBM, Koyama Press, Knockabout, SelfMadeHero, and Blank Slate Books, as well as the cream of the small press. The company is headquartered in Tokyo with an office in London.